After breakfast you will be transfer to the following places. And lunch will be served. 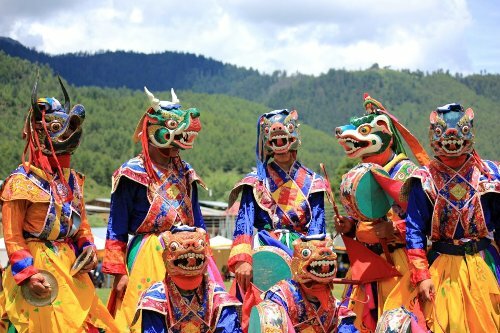 The Jungshi handmade paper factory uses traditional methods to produce the authentic Bhutanese paper known as Deh-sho. Zilukha nunnery in Drubthob Goemba,Thimphu is biggest nunnery in Bhutan. The Nunnery and Goemba once it belonged to the Drubthob (Realized one) Thang Thong Gyalpo often referred to as The King of the open field. In the early 15th century with his multiple talents he popularly became the Leonardo da Vinci of the Great Himalayas. It is located above Tashichhoedzong(2 KM drive from the Dzong). The Zhilukha Nunnery is overlooking the Tashichhoedzong or Thimpu Dzong. You can see many nuns chanting prayers and turning prayer wheels in Zhlukha nunnery. In the same compound there is one-storey building which is serving as sleeping quarters. You can see views of golf course and other side of Thimphu valley. In Bhutan girls and women are admitted to nunneries for short to long period of time. From the nunnery they get an education. Finally they dedicate their lives to serve the society. These nuns are very much involved in local communities in Bhutan and helping needy families. Takin Preservation Centre (contains national animal takin). Evening at leisure or take a walk to the main city from Clock tower square for shopping. 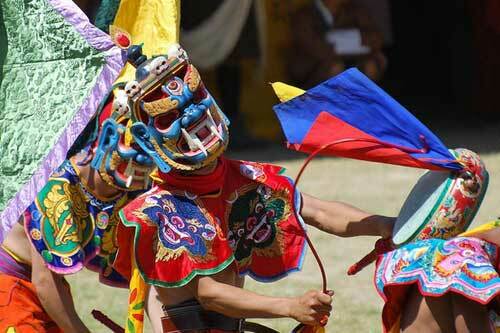 It provides excellent opportunity to mingle with local people. Overnight at a hotel in Thimphu. The beautiful hike takes approximately 50 minutes through rich vegetation and on the way you will see various species of birds and other floral species. The Tango Monastery is a Buddhist monastery located 14 kilometers to the north of the capital city of Thimphu in Bhutan, near Cheri Mountain. It was founded by Lama Gyalwa Lhanampa in the 13th century and built in its present form by Tenzin Rabgye, the 4th Temporal Ruler in 1688. In 1616, the Tibetan, Shabdrung Ngawang Namgyal, meditated in its cave. The self-emanated form of the wrathful Hayagriva is deified in the monastery. It belongs to the Drukpa Kagyu School of Buddhism in Bhutan. Overnight at a hotel in Thimphu. Morning drive to low lands of Punakha valley touching Dochula pass 3,100 m and on the stop at Hongtsho village. Stop at the immigration check point to stamp in your permit. Next to the check point you will find small local stalls selling fresh juicy local apples available for sale in plastic bags you could try some. You will be driving through the first mountain pass in the western part of Bhutan. You will find the 108 Druk Wangyal chortens on the top of the pass where the ridges are draped in colourful prayer flags greet you. You could take three rounds and offer prayers, take some best photo shots. On the ways visit Lampari Botanical park. There is a lake and talk a walk in that park. If the weather is clear you will be able to see the highest peaks towards the north, Gangar Punsum among others is the highest unclimbed peak (24,000 ft) in the world.. If you are lucky you could see red pandas, different species of birds, you can take some photo shot close to the natural lake. Proceed down towards Punakha through Thinleygang village and upon reaching Lobesa turn left and enter Punakha valley. On the way have Lunch at Lobesa and take a hike to Chimi Lhakhang (Temple). 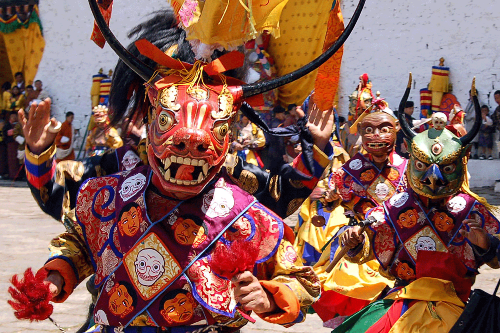 This monastery is dedicated to Lama Drukpa Kunley” Divine Madman” known for his outrageous behavior. It was built in 1499 by Ngawng Chogyal the, 14th Drukpa Hierarch. Many childless women visit this lhakhang (Temple) and seek blessings for a child. The existing footpath to Chimi Lhakhang (Temple) passes through beautiful terraces of paddy filed after crossing paddy field. You will come across a Lobesa Village with lots of traditional house. Lobesa Village is situated in valley, surrounded by paddy fields on the way to important Buddhist Shrine “Chimi Lhakhang” in Punakha. You can very well interact with local people and here also, you can visit some village houses to understand about their life style and proceed towards Chimi Lhakhang (Temple). Drive to Punakha. Overnight at a Hotel in Punakha. Morning we will visit beautiful nunnery built on the hill top of Walakha, join the nuns for morning prayer and later on drive further north of Punakha to visit one of the beautiful Stupa or Temple built on ridge near the Punakha river known as Khamsum Yuelley Namgyel Chorten which will take around 30 minutes to reach from the town. It was built in honour for then Crown Prince Jigme Kheser Namgyel Wangchuk which was built in 1990s and took period of nearly 10 years. From the parking, it will take another 45 minutes uphill hike to reach crossing through rice suspension bridge and rice field and return portion downhill takes around 30 minutes. Morning transfer to Bumthang via Wangdi & Trongsa we drive uphill towards Pela La Pass crossing the Black Mountains that divides western and central Bhutan. The roads uphill is pretty curving with sharp bends but you need not worry as our drivers are well experienced and on the way you will find rhododendron, magnolias and yaks grazing and on clear days you will find the Mt. Jumolhari standing still towards the west, at an elevation of 23,685feet. Before arriving to Trongsa you will pass by Nikkarchu Bridge and here you will find white washed stone chorten built in Nepalese style in the 18th century which lies below the road. This temple was founded by a lama called Shida who subdued a demon that was a trouble to the valley. Here you will experience something interesting as you will be approaching Trongsa where from the road you will be able to view the massive Trongsa Dzong also known as "the never reaching Trongsa Dzong. this place used to be the old gateway between the east and west. If you have time you could visit the Trongsa Dzong and Ta Dzong (Ta means watch tower in Dzongkha) was built in 1652 and now it is a museum which displays Buddhist art and the history of our Monarchy. Overnight at Chummi Bumthang. Bumthang valley is very open and spacious which is different from other valleys in Bhutan, its altitude ranges from 2,600 meters (8530ft) to 4000 meters (13,125 ft).Bumthang is known as heaven for hikers and trekkers and you will come across many beautiful monasteries, also important Buddhist monasteries and pilgrimage sites. This valley is full of surprises and fascinating as almost every valley or hill has a background of interesting myths and legends about kings, Buddhist masters and serpents. 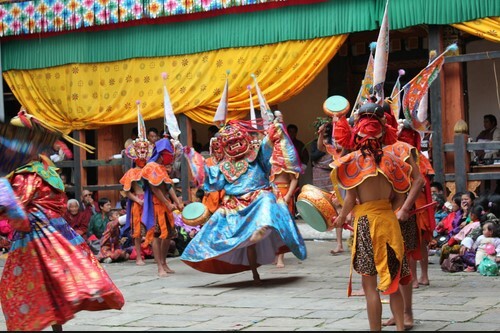 This place is important in terms of religious relics left by the famous Guru Rinpoche and his reincarnation. Morning visit Jakar Dzong founded by a white bird built on a ridge overlooks the valley. 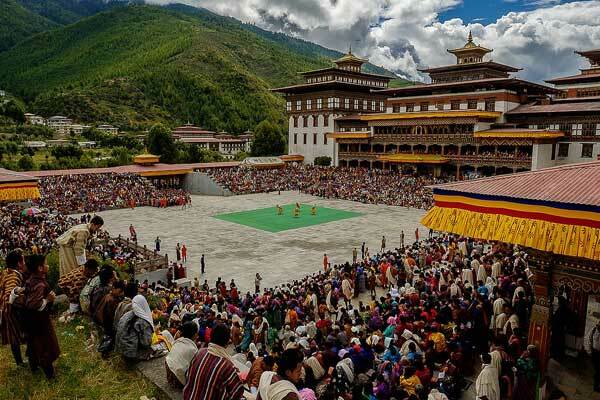 The Kurjey Lhakhang where the kings of Bhutan are taken for their cremation rites. Kurjey translates into “Kur” means body and “Jey “means Lhakhang. The big cypress tree is believed to be the walking stick of Guru Rimpoche. The great Guru also created a holy water hole beside the temple which people frequent either for religious or medical purposes. Wangdicholing Palace – built during the times of the first king’s father, Jigme Namgyel was used by the first King Ugyen Wangchuk as his main residence. Visit the town or take a walk till the bridge though the township was burnt down by fire in recent times. If you are a cheese and honey lover you could try the Bumthang cheese which is available and honey produced in Bumthang. Evening at leisure. O/n at Bumthang. Post breakfast, you will be taken to witness Jakar Tsechu (29th Oct -31st Oct, 2017). 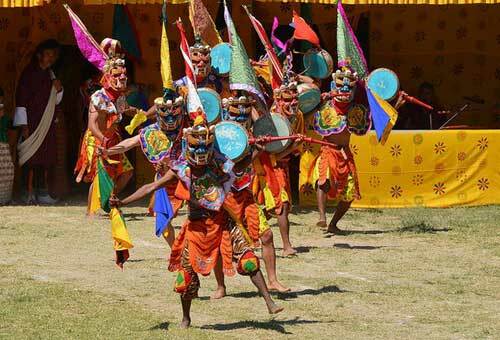 The festival is held at Gangtey Goenpa in Phobjikha valley – the winter roosting ground of the migratory and rare blacknecked cranes. 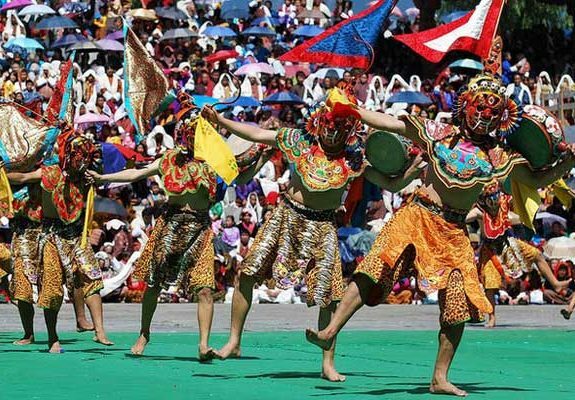 Different kinds of mask dances are performed during the festival. 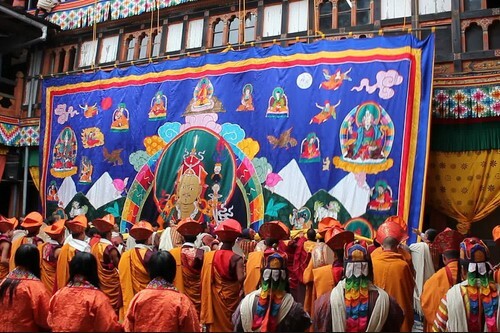 The festival concludes with the Nguedup Langwa (receiving of spiritual wisdom/power) which is a special blessing ritual for the people. Morning visit Lhakhang (temple) Karpo also known as the white temple believed to be constructed in 7th century by Tibetan king Songtsen Gempo in his mission to built 108 temples throughout Tibet, Ladakh and Bhutan. 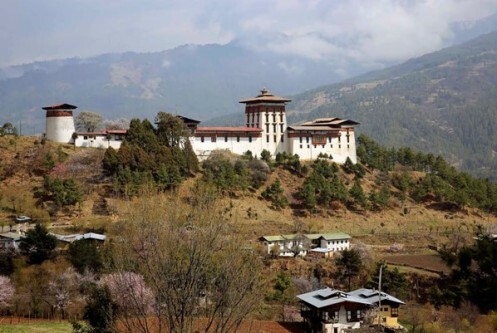 Then drive to Paro, after lunch visit Rinpung Dzong is a large dzong - Buddhist monastery and fortress - of the Drukpa Lineage of the Kagyu school in Paro District in Bhutan. 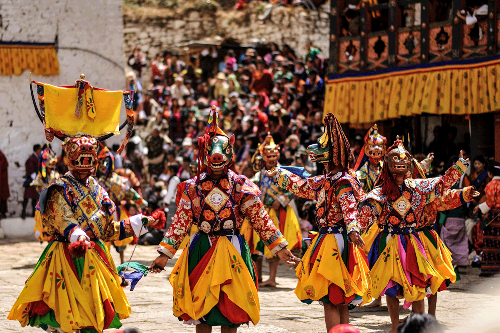 It houses the district Monastic Body and government administrative offices of Paro Dzongkhag. 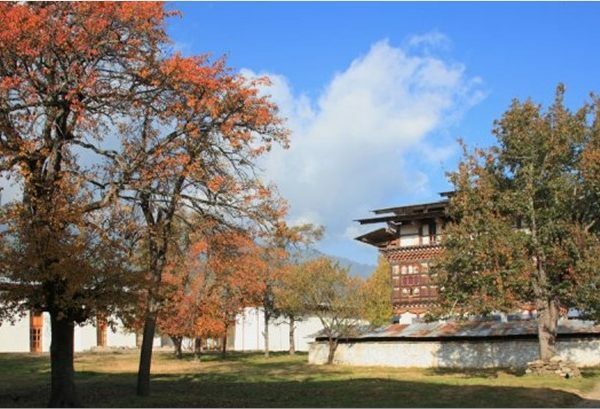 Kichu Lhakhang - The Jowo Temple of Kyichu is one of the oldest temples in Bhutan, originally built in the 7th century by the Tibetan Emperor Songtsän Gampo. It is considered to be one of the 108 border taming temples he built. Taktshang (Tiger’s Nest) falls in top 20 places to visit in the world. Paro is a valley of religion and myth. The most famous landmark, Taktsang Monastery (Tiger’s Nest), stands on a granite cliff about 1000 m above the valley. 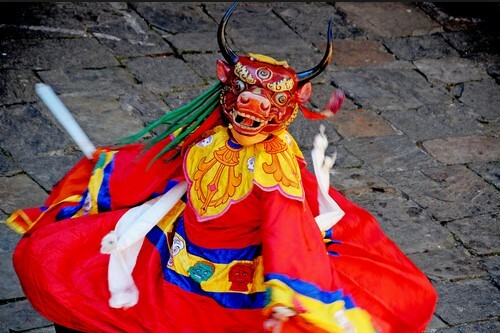 It is believed that Guru Rinpoche, a famous Buddhist saint, flew to Paro on a tigress and meditated at Taktsang. 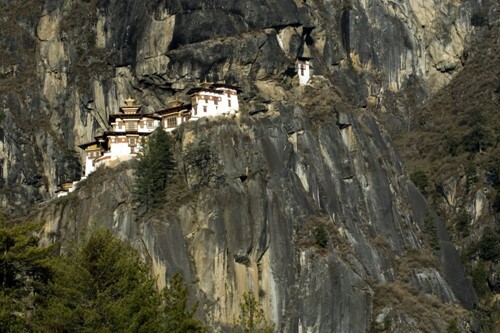 The monastery is considered a national treasure of Bhutan. The hike to Taktsang would take us around 2 ½ hrs to reach a cafeteria, a point from where one can enjoy great view of the monastery. Those interested can walk further 45 minutes uphill to get a closer view of the monastery. Walk down back to road. The journey downward to the road would take us less 1 ½ hrs. Have lunch in Hotel. After lunch take a walk in Paro Bazar for shoping. Overnight at the Hotel in Paro.